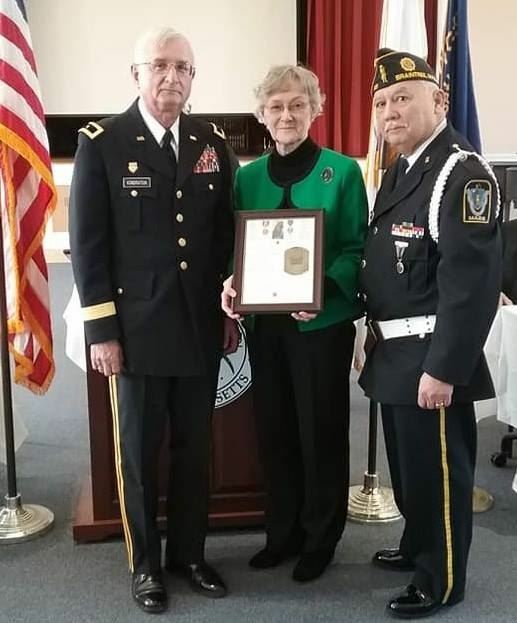 Mary Frazier (above) being presented an appreciation award as Curator of the Braintree Historical Society for work she and others, there, did in conjunction with the celebration of the 100th Anniversary of the American Legion. Mary is shown with General Leonid Kondratiuk, Director of Historical Services and Militia Affairs for the Commonwealth of MA, and American Legion Commander Pedro Vidal. 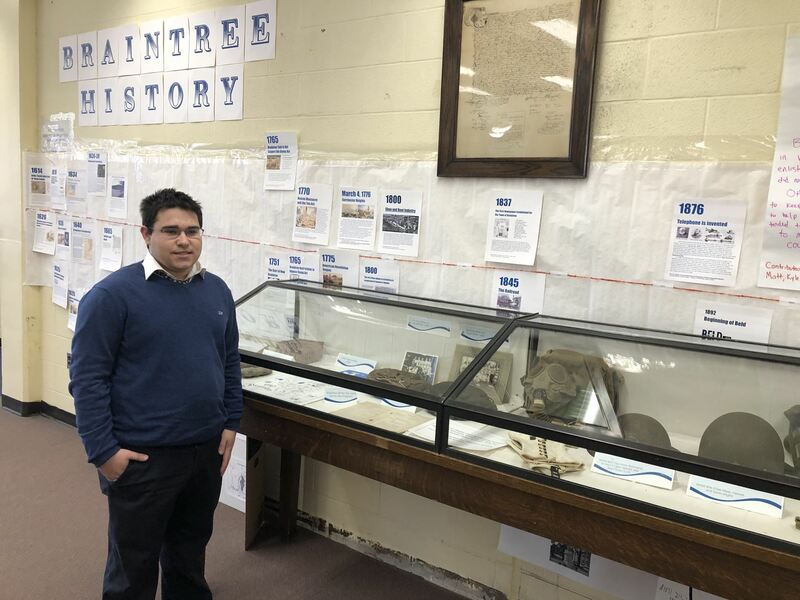 At the beginning of the 2018.2019 school year, students from Braintree High School’s History of Braintree course visited Braintree Historical Society’s campus for an overview of the role of the Society in preserving Braintree’s history. 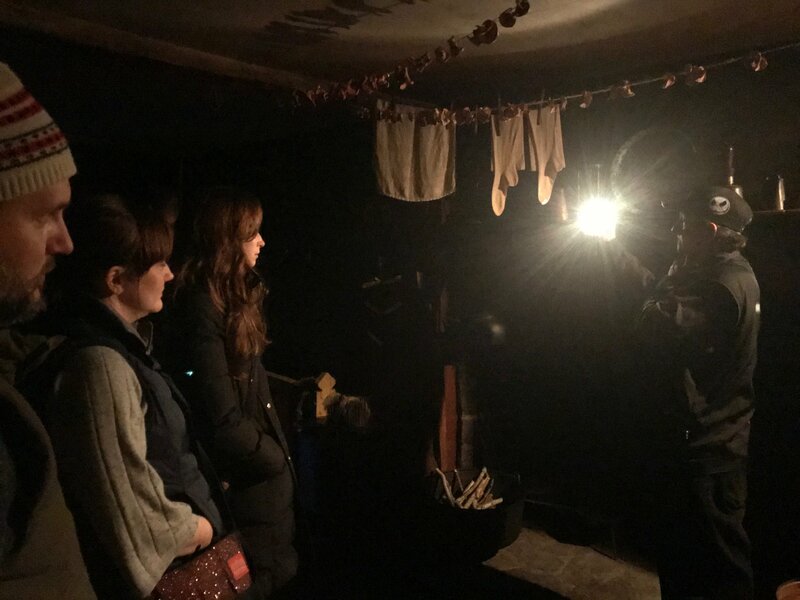 Students toured the Society’s Gilbert L Bean Barn and Mary Bean Cunningham Historical Resource Center where more than 6000 historical artifacts rotate through topical displays and another 6000 or more books, documents and photos are available for exploration by Society members, researchers and other interested visitors. One high school senior, Gerald Ridge, has taken his initial visit further in a major way. Gerald has joined the Society’s volunteers working one afternoon a week on a variety of tasks vital to the Society. 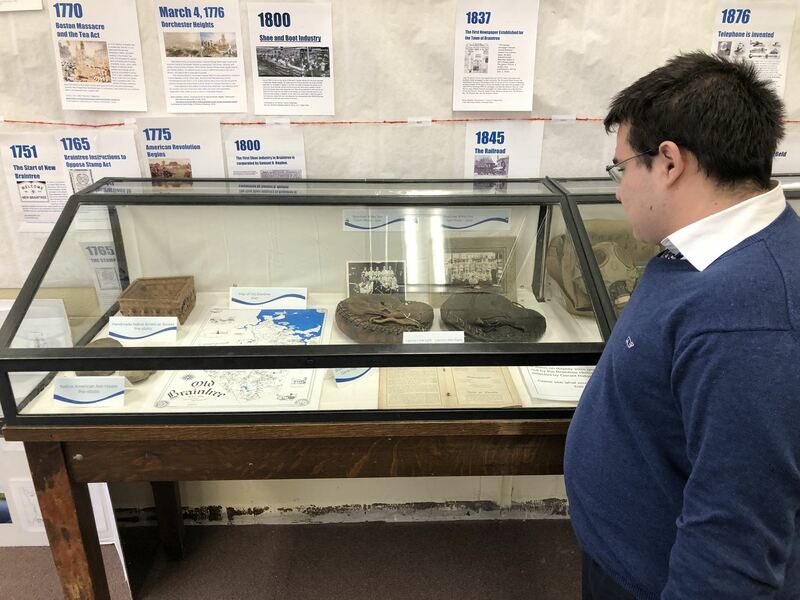 While Gerald has committed to volunteering for the full school year, he chose to highlight items from the Society’s historical collections in his final course project. In a large high school Media Center display case, Gerald has selected for display artifacts from the Society’s Native American past, items from the history of the Braintree White Sox baseball team and items from Braintree’s World War I and World War II soldiers. 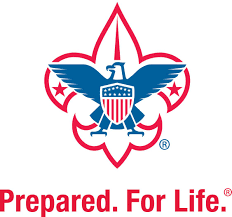 The Braintree Historical Society is excited to have this opportunity to support the High School’s Social Studies Program under the direction of Dr. Gorman Lee, to support Gerald in the development of his course project and to have Gerald as a valuable Society volunteer. Presenter Jon Curley - poet and Senior University Lecturer of Humanities at New Jersey Institute of Technology will discuss the creative work of Italian anarchist Bartolomeo Vanzetti, arrested, convicted, and executed for his alleged role in a 1920 South Braintree payroll robbery of the Slater and Morrill Shoe Factory during which the paymaster was killed. Curley edited a short story by Vanzetti which was published in 2018 by PM Press. He will read an excerpt from the story and use it to reflect on both local and nationwide historical issues, past and present, including immigrant and immigrant rights, radical politics, prison literature, creative New England culture, and how we might reconsider the legacy of Bartolomeo Vanzetti's through his writing. We all had an interesting time last night with the Unexplained Paranormal Research... Here are a few shots of the evening taken by Dave Crispin . 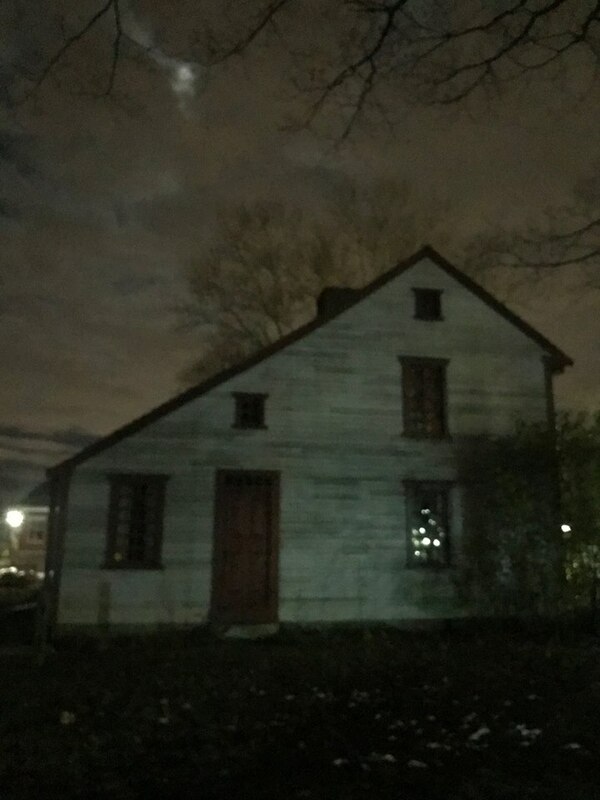 There were several electromagnetic forces detected, some strange voice recordings and a flashlight placed on the mantle of the Thayer house that kept turning off an on as questions were asked, and a lot of inquisitive questions. 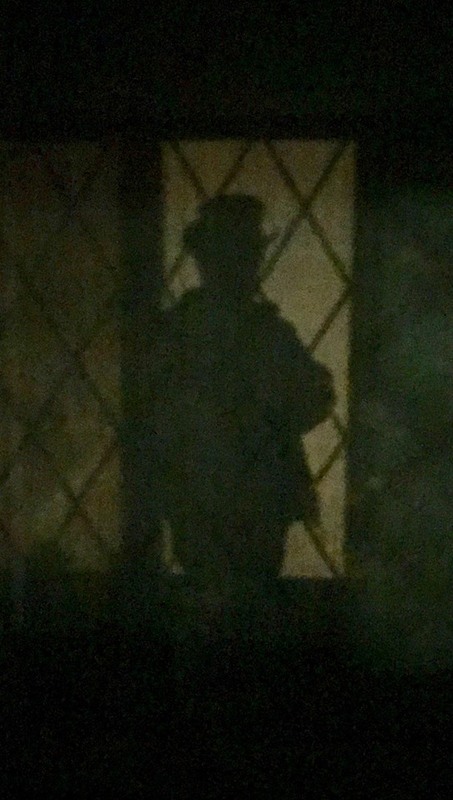 There were some strange happenings in the neighborhood! Hmmmnnnn! 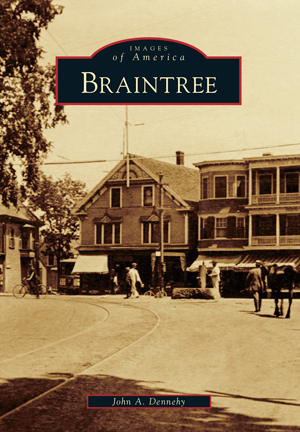 It’s always nice when hearing a personal account of Braintree history. While many know the names of those affecting town and country history, it is a bonus when exposed to a personal account. And better still when audience members get to share their stories relating to that personal account. 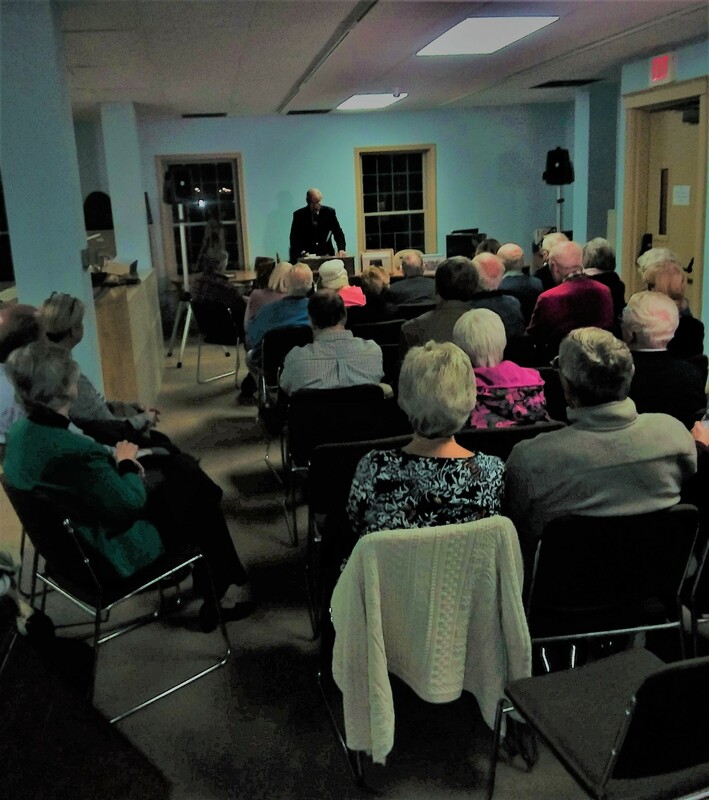 Thus was it so when author Wayne G. Miller gave his presentation at the Braintree Historical Society regarding the history of shipbuilding in the region. 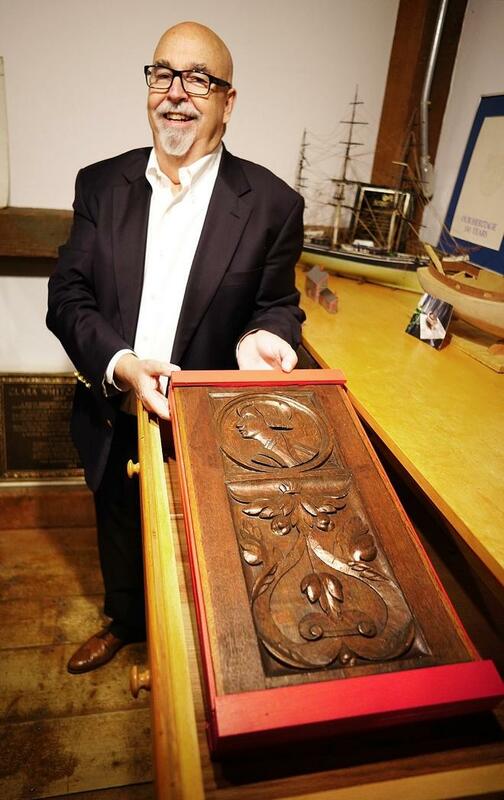 After Mr. Miller spoke and shared his experiences growing up near the Fore River Shipyard, those present were treated to a tidbit of a personal experience of one of its oldest attendees. Bill Varroso shared his story of working at the Quincy Shipyard at 17 years old. He later served on a ship that he had helped build, the USS Underhill. And he was onboard that same ship (and assisted with the rescue of shipmates) as it sank in the Pacific Ocean. The meeting was very well attended was followed by lively discussions as others shared their stories of their own personal memories enlivened by the authors own reminiscing. IT WAS GREATER THAN A “GRAND ReOPENING”! 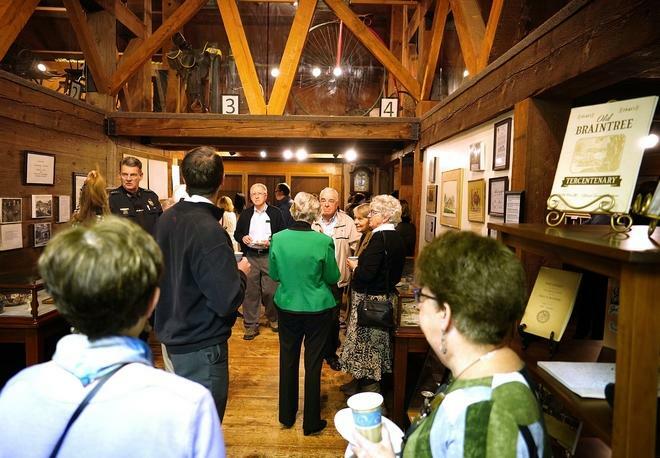 With over 100 guests attending, the Braintree Historical Society’s reopening of the Gilbert L. Bean Barn and Mary Bean Cunningham Historical Resource Center could not have gone any better. There was a resounding air of positive energy, community and fellowship. Braintree Mayor Joseph Sullivan and several representatives of the Town Council and Civic Organizations graced us with their presence. In reaffirming the continued contribution the Town makes, the Mayor encouraged and underscored the need for members of the community to also support the Society. This support is now coming in many forms: much needed financial pledges and contributions and growing number of important historical items being accessioned to our museum, a growing awareness by the public of the discoveries that can be made from the rich and unique resources available under our roof. 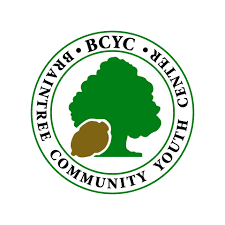 Above all, the community’s support is echoed by acknowledgment of the now over 85 (and growing) Volunteer core, allowing us to further expand our activities and better serve Braintree. 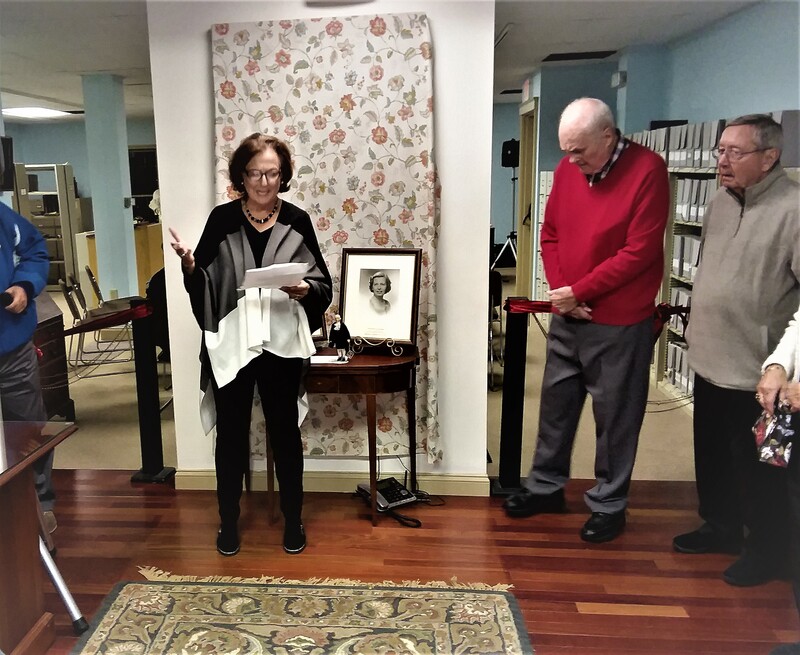 Re-opening of museum and resource center result of a revitalized Braintree Historical Society. 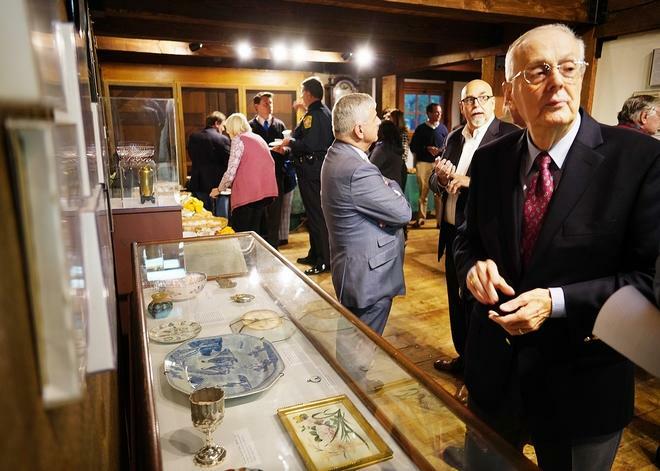 BRAINTREE − With an eye towards better displaying and preserving the history of the town and the world, the Braintree Historical Society rededicated the Gilbert L. Bean Barn and Mary Bean Cunningham Resource Center Thursday night. The barn displays a variety of artifacts, including ceramics collected by the Beans.“They traveled all over the world, and they picked up a number of things wherever they went,” said Ron Frazier, a former society president who was given a number of the items now on display by Bean Cunningham on her death. He loaned them to the society. Gilbert Bean raised the money to build the barn behind the Thayer House, which opened in 1976. Mary Bean Cunningham, who remarried following Gilbert Bean’s death, raised the money for the addition, dedicated in 1995, which was intended to house a library and research facility. Several years ago, a former executive director of the society decided to move much of the library to the Watson Building in East Braintree, which Frazier said proved to be a financial disaster for the society. Bob Harris said much of the society’s collection was stored in an attic which was not climate controlled and left the items vulnerable to damage. The files were very disorganized, he said. 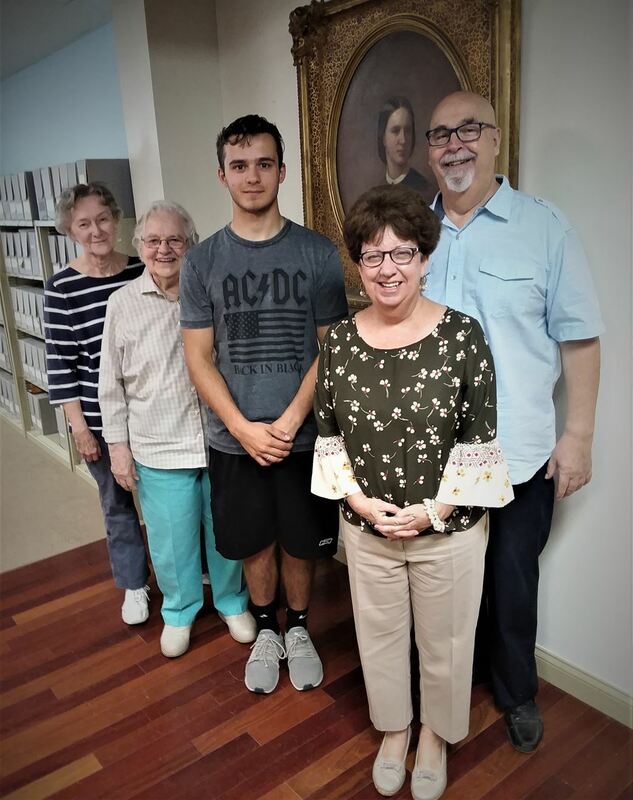 Over the past two years, volunteers including members of the society and high school interns took on the task of moving items from the attic into the climate-controlled basement and organizing the society’s files and library. The job is ongoing. In the process, the society itself has been revitalized. Cheryl Edgar, the society’s vice president and program chair, said the now all-volunteer society has seen its volunteer base grow from six a couple years ago to 87 today. The goal is to reach 100. The society is launching a membership drive and has a new web site, she said.With the added help, she said the group is hoping to expand the opening hours of the museum and the Thayer House, continue to expand its school programs, as well as offer rotating exhibits. Cheryl Edgar, Vice President of the Braintree Historical Society officiated as the Master of Ceremonies for the evening. 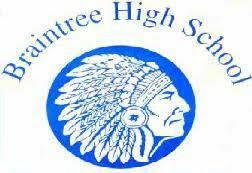 The Braintree Historical Society is happy to have the opportunity to partner with Braintree High School in support of this year’s History of Braintree course. Students enrolled in this semester-long, research-based course will research and examine the history, geography, economy, government, and politics of the Town of Braintree, Massachusetts, from its founding in 1625 to the present day. 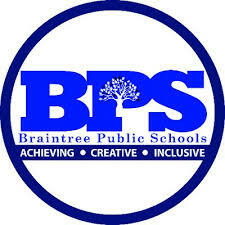 Beginning with discussions in the 2017/2018 school year, Gorman Lee, Director of Social Studies for Braintree High School is partnering with Braintree Historical Society as a part of this year’s class. On Wednesday, September 26, 2018, students in the History of Braintree course, Mr. Lee and Bob Harris of the Society’s Board of Directors, met at the Civil War Monument on the Town Green. 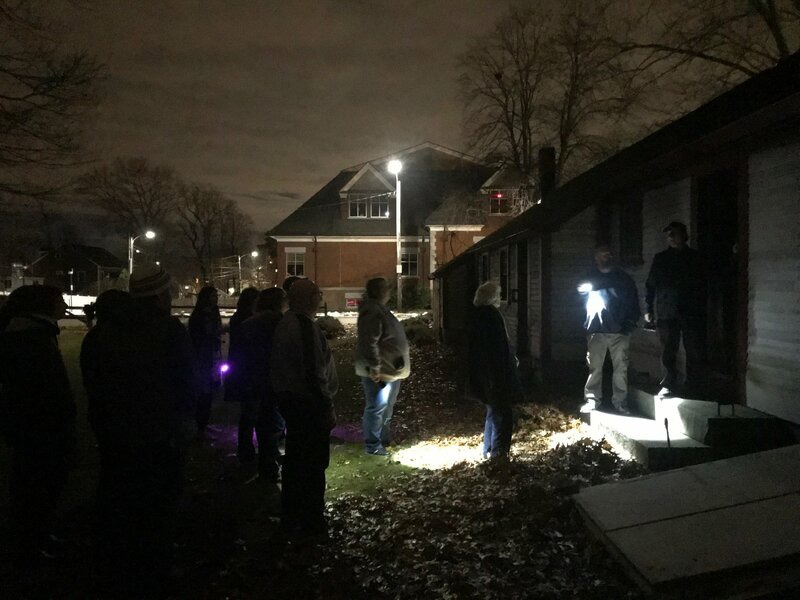 After a brief discussion of the monument, Dr. Harris reviewed the Society’s three homes on Washington Street in a short walk to the Society’s Gilbert L. Barn Museum and Mary Bean Cunningham Historical Resource Center at 31 Tenney Road. Students had an opportunity to tour the Society’s newly relocated historical library and genealogical resource center, to look at historical items on exhibit on the building’s ground level, including a Roman oil lamp, circa 70 – 100 AD (currently on loan to the Society), and to look at some of the items in storage in the building’s newly restored lower level climate-controlled collections storage area and lower level library. Students will be exploring, investigating, and analyzing various primary source documents and artifacts that collectively tell the story of their hometown, including items in the Society’s collection. Students will contribute in developing the primary text for this course and will also complete a culminating final research project (or paper). 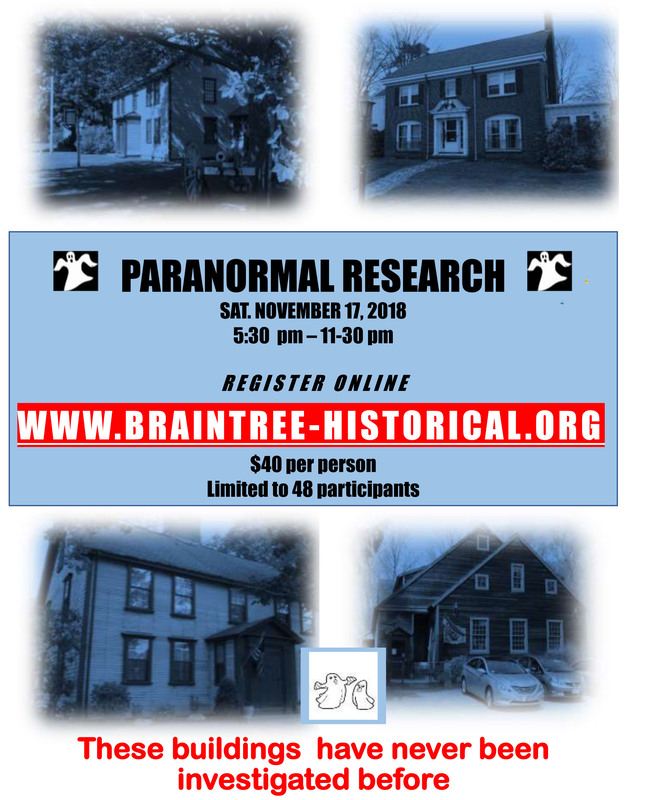 The Braintree Historical Society is pleased to support Dr. Lee, his students and Braintree High School in this initiative and in collaborative efforts in future years. 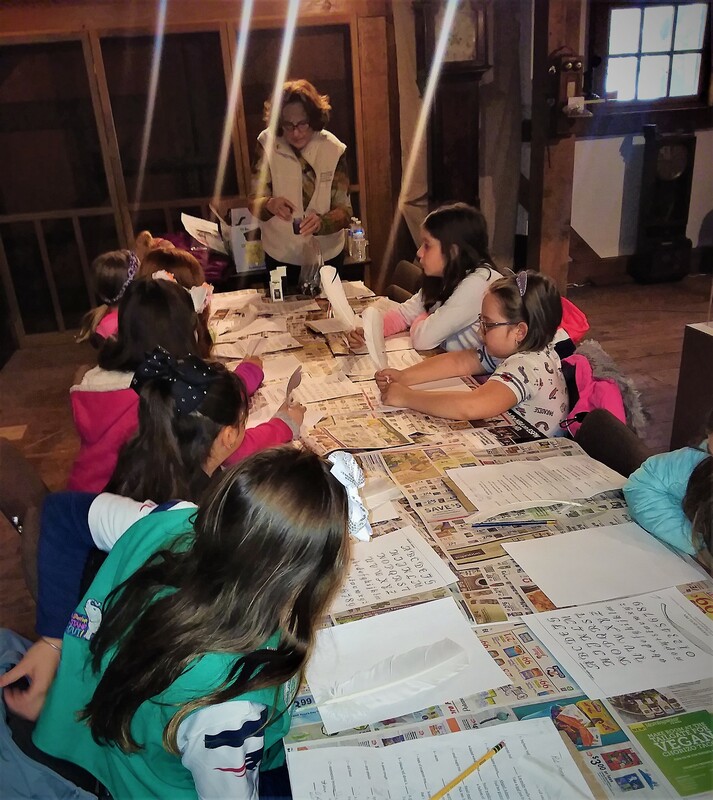 The Braintree Historical Society is excited to partner with students from CATS Academy in their year-long initiative to support the Braintree Historical Society with community service. The Academy, located in the newly-renovated former Norfolk County Hospital for the Treatment of Tuberculosis, has reached out to the Braintree Historical Society with an offer to volunteer time and effort in all areas of the Society’s needs for volunteers. Ms. Darcy Daniels, of the CATS Academy History Department, met initially with Society Board Members, Bob Harris and Aziz Karsan to explore the opportunity for CATS students to volunteer at least one afternoon a month over the course of the 2018/2019 school year. Ms. Daniels offered to support a group of 10 to 12 students to assist the Society in tasks varying from electronically documenting collection items, to tech and social media support, to events preparation and to grounds maintenance – an offer that is welcomed with open arms! 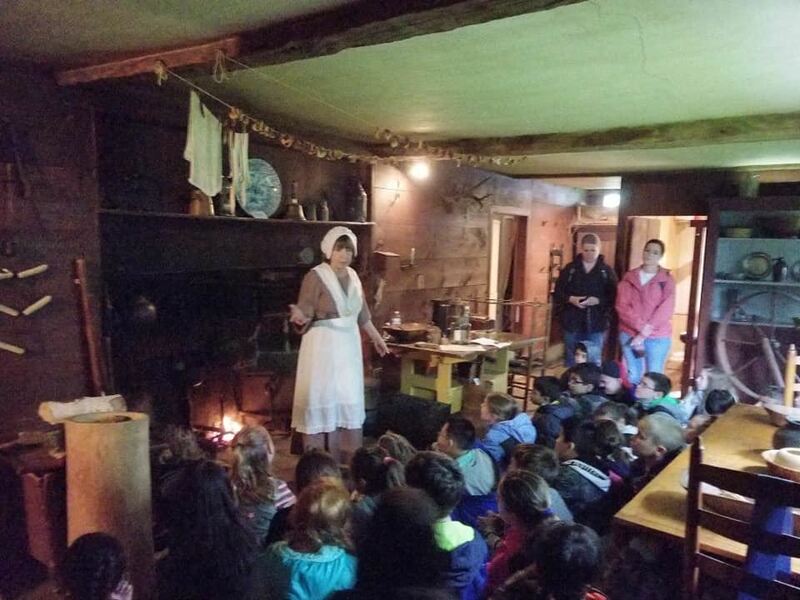 Twelve students, Ms. Daniels, Mr. Karsan and Dr. Harris met for the first time on the afternoon of Wednesday, September 26, 2018, for the students to receive the Society’s recently-developed Volunteer Orientation presentation, to answer student questions and to tour the Society’s collection displays on the Barn’s ground level. 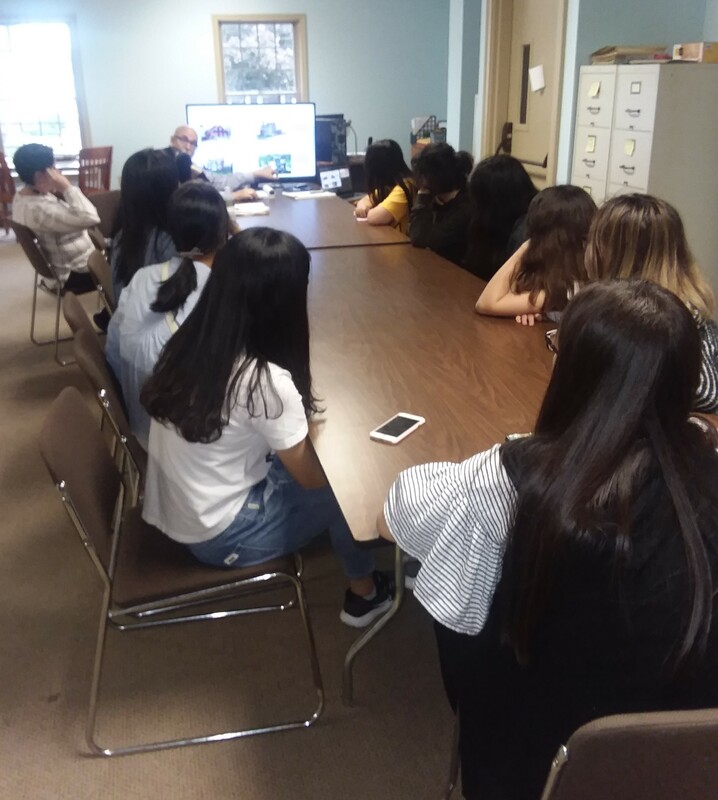 The students, from Asia, Mexico and South America, had many questions and ideas, including how to “hook us (BHS) up” with an Instagram account with which each of the students will share their 1000 followers (a potential total of 12,000 contacts for a BHS social media Instagram account). The CATS students and Ms. Daniels will be volunteering once weekly to help prepare for the Society’s Grand Reopening of the Gilbert L Bean Barn and Mary Bean Cunningham Historical Resource Center. The Society looks forward to energetic and enthusiastic contribution of these young volunteers. 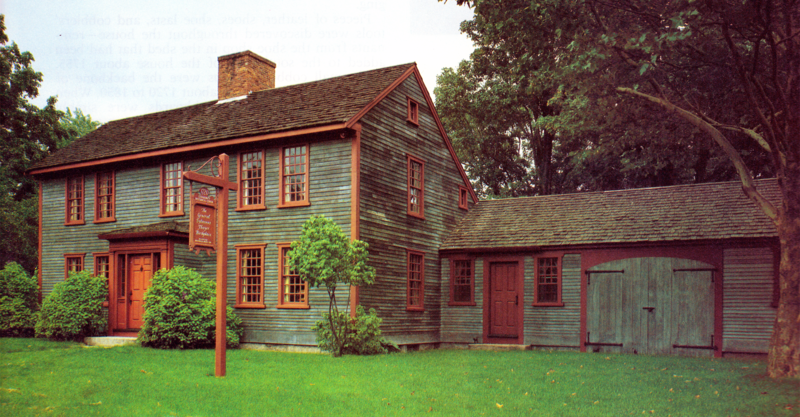 In collaboration with the Braintree Historical Society and the Braintree Public Schools 3rd and 5th grade students will visit the General Sylvanus Thayer Birthplace during the first two weeks of June 2018 for their annual "Braintree, Our Town" field trip. Two other stops of this Tri-Visit Program include visits to the Braintree Fire Station for a tour and fire truck exploration and a visit to Braintree Town Hall, where they meet the Mayor, view the original Indian Deed to the Town of Braintree, and tour the operations of their local town government first hand. 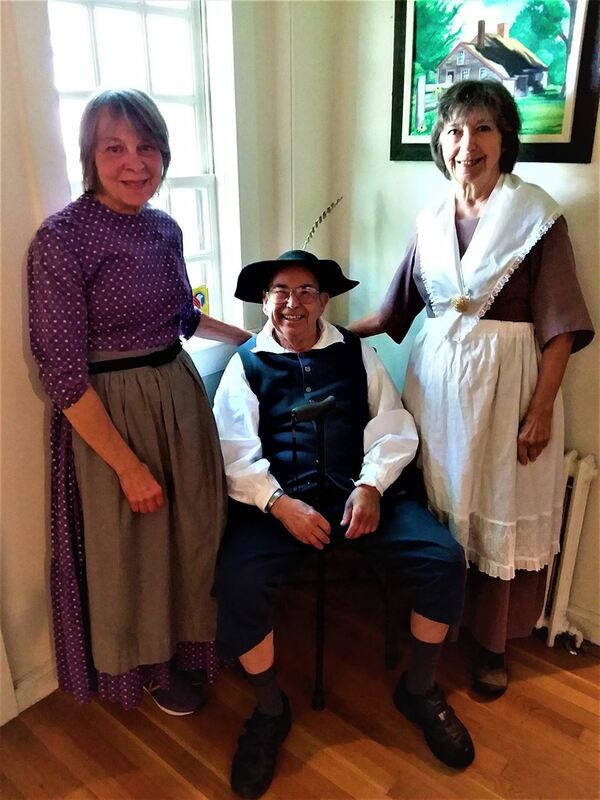 At the General Sylvanus Thayer birthplace, children will be greeted by a costumed volunteer and after a brief introduction about General Sylvanus Thayer and the 1720 home in which he was born, they will begin their educational tour stepping back to the period of 1785. 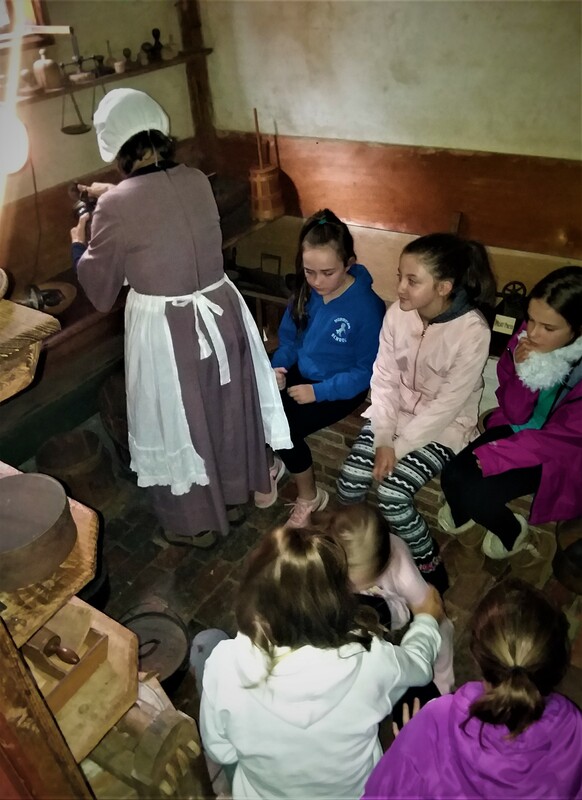 Through guided talks by volunteers and demonstrations of the crafts and chores necessary for everyday living, they will experience what life was like for Sylvanus as a little boy growing up in Braintree at that time. 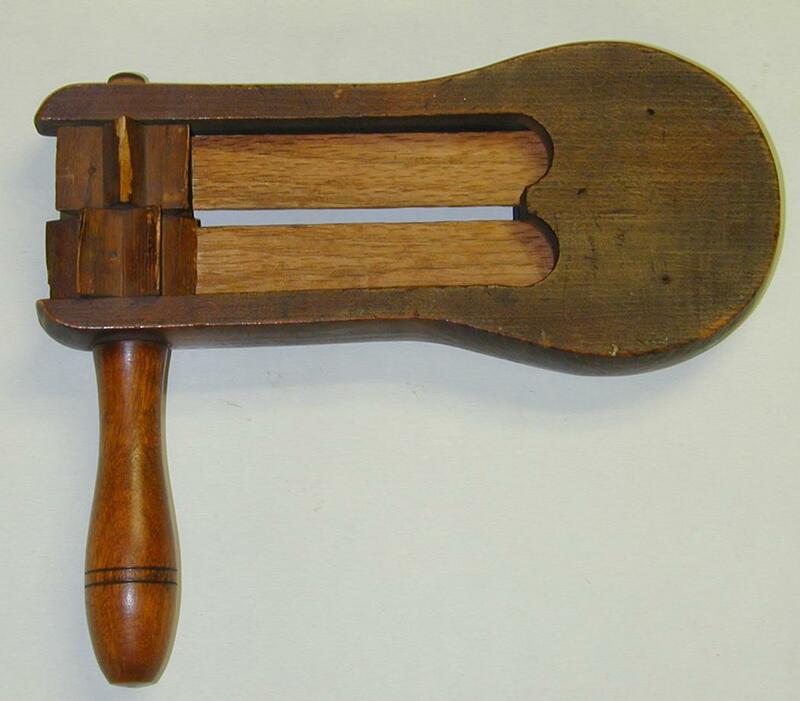 HINT: Made entirely of wood, probably elm, this item is approximately 6” wide with a 5” handle. This is a carriage jack. The wood fame jack with iron serrated edge was used to lift your wagon, carriage or cart when the wheel broke or fell off or the axle was damaged. They were in extensive use throughout the world until the beginning of the 20th century. 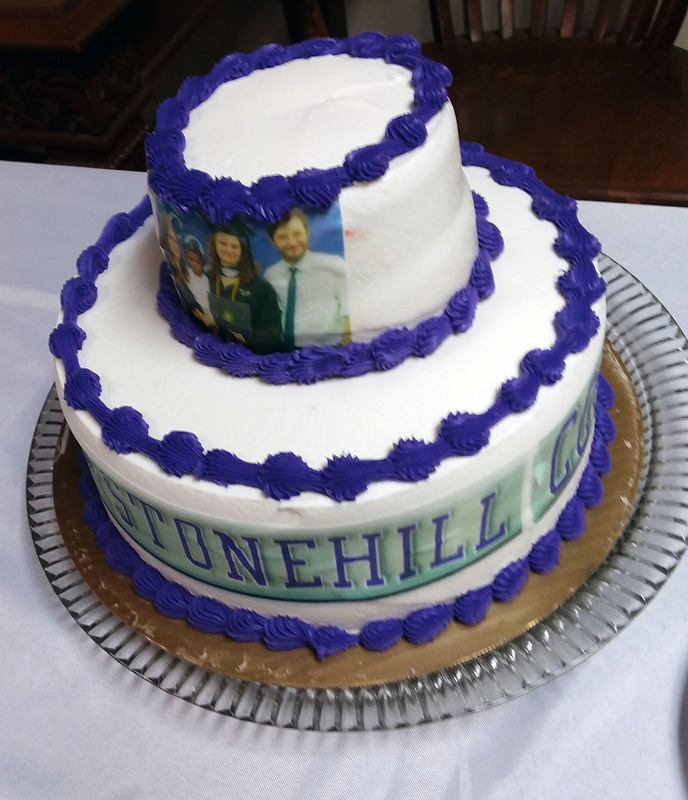 On Sunday, August 26th, the Bowes-Andrews family of Braintree hosted a Graduation Party on the Society's campus for their daughter, Alyssa, celebrating her graduation this year from Stonehill College with a major in history. Fifty family members and close friends attended a delightful gathering featuring a catered buffet dinner with beverages and desserts. 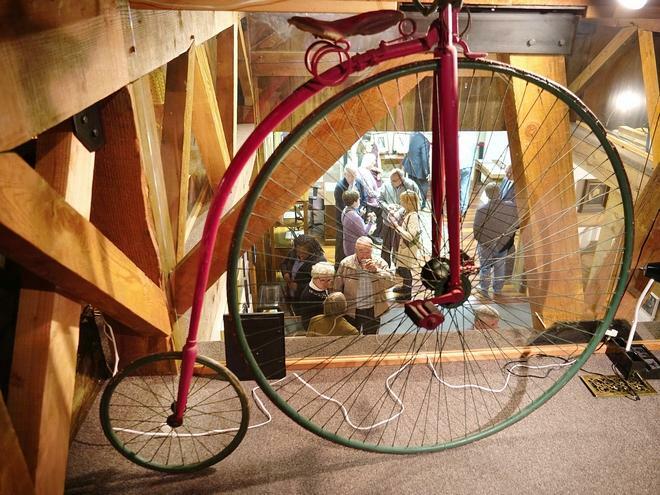 In addition to enjoying the ambiance of a historical venue, guests were able to see artifacts of local and national historical significance on display in the Society's newly reorganized Barn. 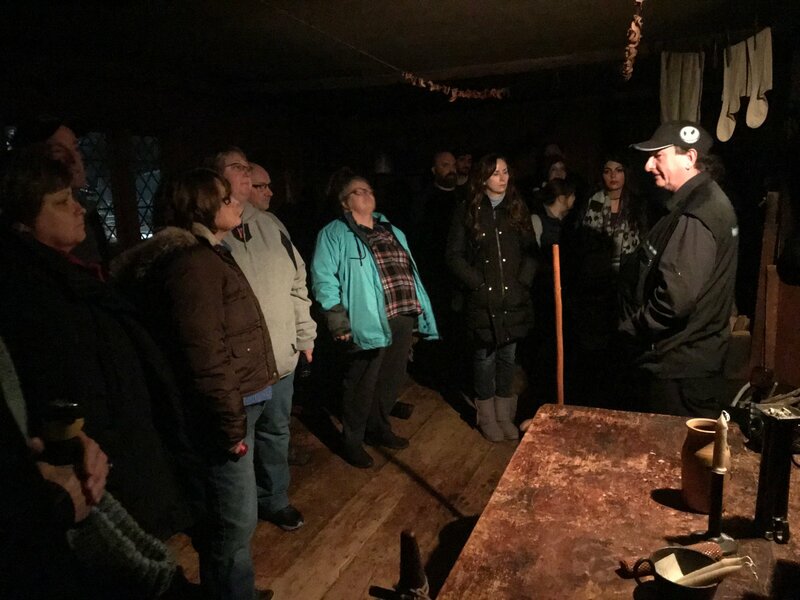 And over 30 guests participated in guided tours of General Sylvanus Thayer Birthplace, an 18th century home and museum, with period furnishings that captures what home life was like for a middle-class family in the 1700s. The 3 hour celebration took place under the shade of the campus's old trees, with a pleasant breeze and a perfect blue sky. The day and the celebration could not have been better! John A. Dennehy was born and raised in Braintree. He is a former member and past chairman of the Braintree Board of Selectmen and past president of the Braintree Historical Society. He is an attorney and a history professor. 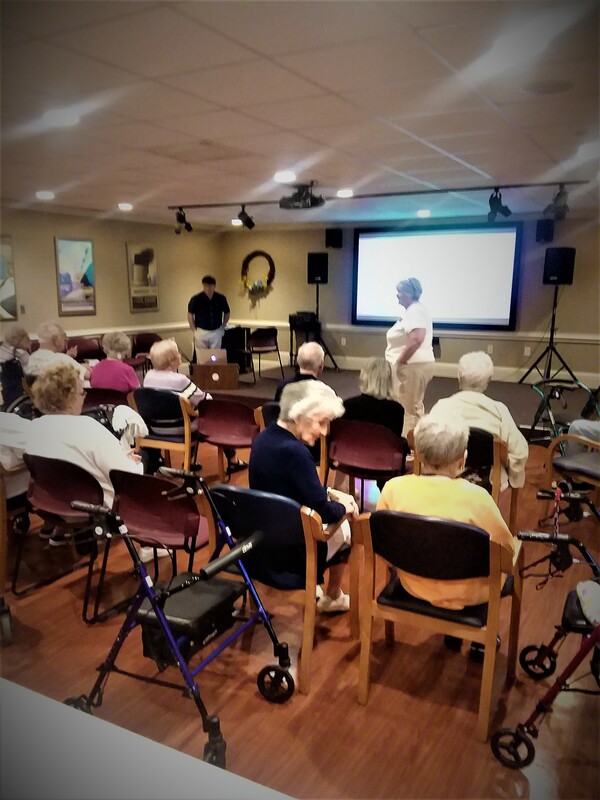 On Thursday afternoon, August 30, 2018, John presented a Photographic History of Braintree to residents of Glen Manor Estates, an assisted living facility in Braintree, which offers activities at their location for residents. An enthusiastic group were reminded of how the face of Braintree has changed from its formative years to today. First settled in 1634 Braintree was primarily a farming community for almost three centuries and home to a number of water-powered mills and businesses, which prospered along the banks of the Monatiquot River. Horse ridden paths gave way to trams and cable cars later to be replaced by classic motor cars for the wealthy until Henry Ford introduced mass produced vehicles that now smother our roads. With the arrival of the railroad in the mid-19th century, several manufacturing plants were built near South Braintree Square. Farming and manufacturing have since been replaced by white-collar businesses and retail establishments. Since World War II, Braintree has become home to a larger and increasingly diverse residential and business population due in part to its proximity to Boston and three major highways. John painted vivid images of life then, supported by his photographs, stories and his passion for history. He included many previously unpublished photographs from the archives of the Braintree Historical Society. These sparked so many memories of life then by this retired community! by emailing BHS at braintreehistoricalevents@gmail.com to confirm availability. Group Tours are encouraged.